Trade your shoes for boots, your phone for a real friendly face and the mall for an eagle’s eye view of the river, the scent of sweet sagebrush riding the breeze. Come visit Bar Diamond Ranch, where next door is miles away and the nearest neon is a five-day ride on a good horse. Come visit Bar Diamond Guest Ranch, where next door is miles away and the nearest neon is a five-day ride on a good horse. Bar Diamond Guest Ranch is a working ranch on 34,000 expansive acres along the Red Deer River in Bindloss, Alberta – ninety minutes north of Medicine Hat and 3½ hours east of Calgary. Here on the ranch, we live in harmony with the land, learn from nature, know our neighbours, eat very well and know how to have a good time. Leave your worries in the city and hide away at Bar Diamond Ranch. Bunk down in comfortable modernized rooms in an historic 113-year-old log ranch house – and fuel up with hearty family-style meals made by our chef using wholesome farm fresh ingredients. Spend your days exploring the spectacular Badlands landscapes, snacking on cactus berries and racing the river on a speedy jet boat. You will experience the warm neighbourly welcome of the small prairie towns that surround us and lay down your worries for a few days of prairie peace. 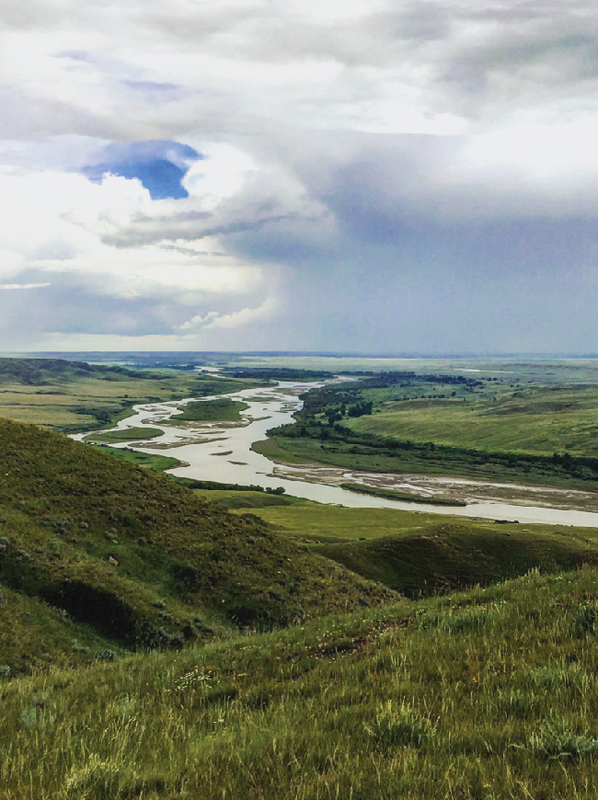 This land has a long history and you will have plenty of chances to discover more than 600 Blackfoot teepee rings, two medicine wheels and an ancient vision quest site. Or take a peaceful saunter in the company of eagles, herons, antelope, deer and elk. Time your holiday right and be here for the ranch’s annual cattle branding. In the evening, kick back on the verandah to trade stories and watch all the shining stars in the dark black skies – until green and pink aurora mosey on stage and steal the night. We are Jim and Carol Hern. We and our family welcome you to our home at Bar Diamond. Please contact us with any questions about your holiday at the Bar Diamond Guest Ranch. Are you looking for a custom Prairie hunting experience? Stop by the Alberta Western Uplands website, also operated by the Hern family.